Meet the crew at Carolina Cat Chronicles who covers the latest Carolina Panthers news, rumors, draft talk, and more. Co-Founder of C3, I'm first a father to three beautiful children and husband to an equally beautiful wife (all Panther fans may I add). C3 emerged out of a friendship between Joe Riollano (that Freak'n Puerto Rican) and myself, who found themselves living in different states and often infrequently in contact. Football and the Carolina Panthers, however, helped us stay in touch and keep alive a bond that may have dissipated with time and distance eventually. We've come a long way since our first half-time hangout to now building a successful website, a collaborative video network, multiple NFL podcasts, Panther fan-clubs, and dipping our toes into professional radio broadcasting. (Check me out every week Pirate Radio 1250's The Sports Bar with Clip Brock. All that aside, this project (which emerged organically) has always been meant to be fun, fan-oriented, and a place where develop and maintain friendships. Thanks for helping us in that process. Beyond your support, however, I'd like to ask you to join us in this effort. Visit, comment, listen, participate, and contribute. All or any, that's all you have to do to help us build Panther Nation and C3. The C3 Network is an affiliation of independent contributors that we thankfully featuretheir content on CarolinaCatChronicles.com. 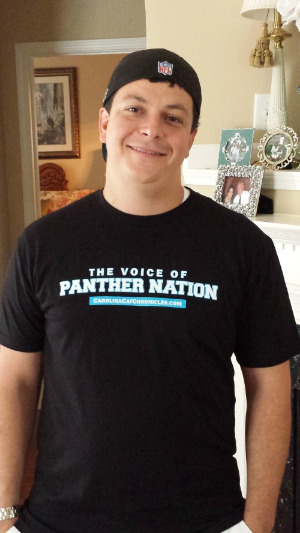 Some are Panther fans, others are NFL fans or analysts, but all are friends of the family. All opinions and content remains exclusively their own, as does responsibility. Named Straight Facts because that's what I speak on this Youtube, Destined to be a Panthers fan, I was born on the same day Carolina got a team and even gained the nickname, Panther, because I talked so much football and Panthers as a child. Straight Facts will bring together that football knowledge with entertaining trash talk. For the full effect, you can find me tossing my hat in the TTC ring (Trash Talk Circle). Check out this aspiring sports broadcaster on Twitter @TMuhammad23 and MrTMoney1993 on YouTube.